This is a hotch-potch of a recipe but the umami flavour of the miso paste works really well with the traditional English ingredients of honey, apple and sage. I was wandering round the butcher’s counter and fell for a seductive rack of free-range Berkshire pork: that’s the pork loin with the rib bones left in. 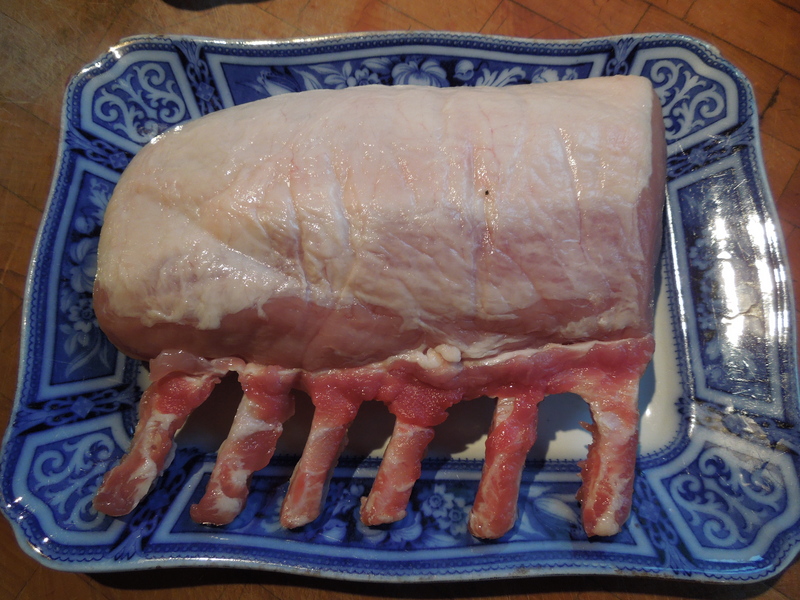 Ask your butcher to French-trim the bones as s/he would a rack of lamb. Mine had been trimmed of the rind too and had just a little fat left on. I wanted to roast it without the meat drying out and this recipe did the trick: it was deeply savoury but still juicy. 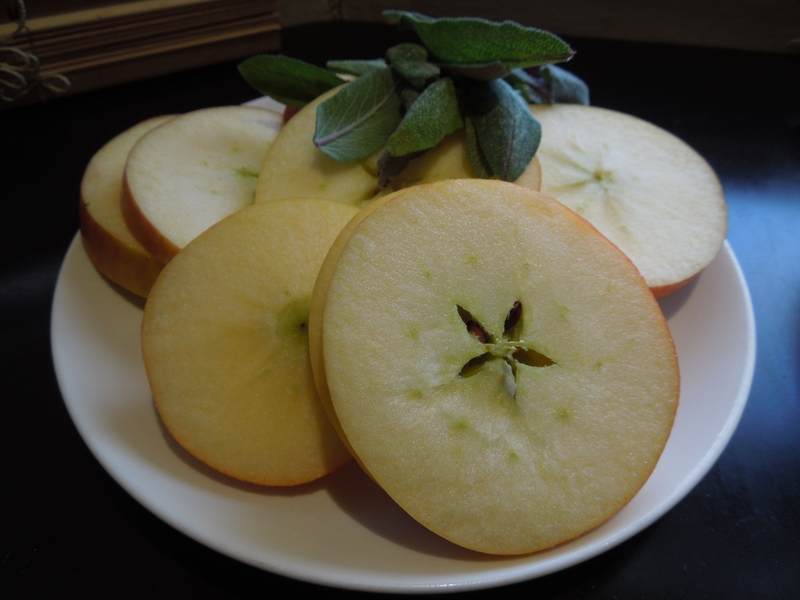 We served it with garlic mashed potatoes and pan-fried apples and sage (see below) and the first runner beans from the garden. It made a fantastic Sunday lunch. If the meat has the rind on, remove it, leaving about 1/3″ of fat on the joint (you can cook the crackling separately if you like). Wrap tin foil round the bones protruding from the joint to stop them burning. Score the fat lightly into a criss-cross diamond pattern without cutting into the meat. 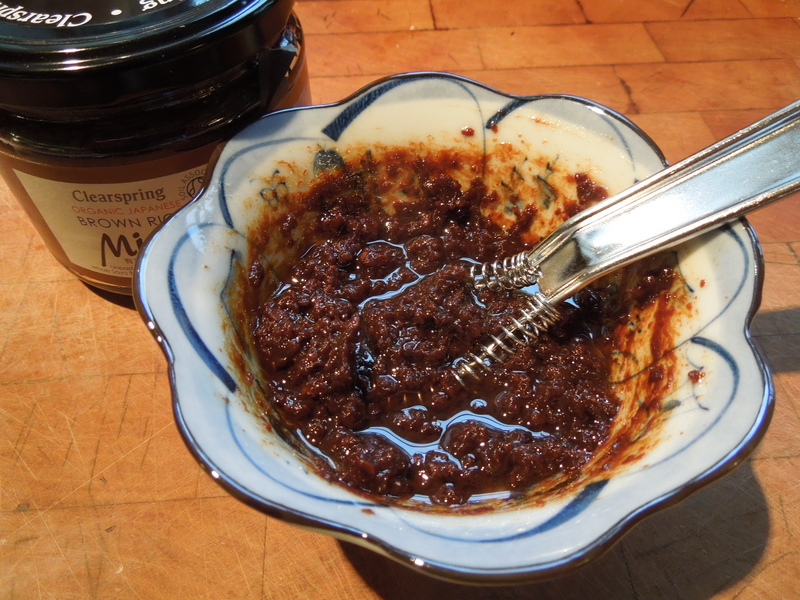 Whisk the miso paste and olive oil together and brush liberally all over the meat, front, back and sides. You don’t need any additional seasoning for the meat, the miso is salty enough. Put the meat in a roasting tin bone-side down and cook for 30 minutes.While the meat is cooking whisk together the extra miso paste and the honey. After the 30 minutes, turn the oven up to 400F/200C/Gas Mark 6. Remove the meat, brush the top with the miso and honey glaze and put it back in the oven for another 15-20 minutes or until a meat thermometer inserted into the thickest part of the meat reads 145F, but remember the meat will continue to cook while it’s resting. 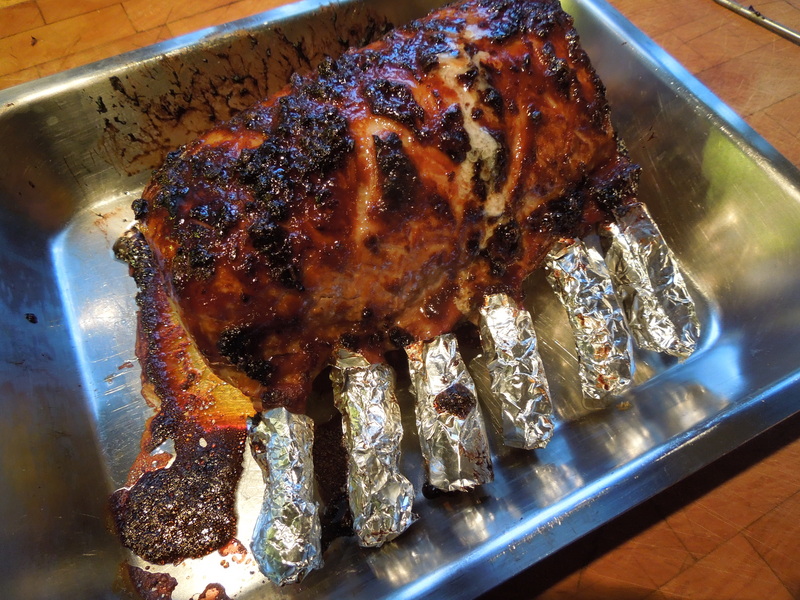 Take it out of the oven, cover loosely with foil and leave to rest for 10-15 minutes. Boil the potatoes with the garlic and a pinch of salt until soft. Drain them and steam them dry. Melt the butter in a pan with the milk, pour into the potatoes and garlic, and mash until smooth. Check for seasoning and keep warm. Slice the apples horizontally into thickish rings. No need to skin or core. Melt the butter and oil in a medium-hot frying pan and fry the apple slices on both sides until golden. Remove and keep warm. Throw the sage leaves into the same pan and fry until crisp, just a minute or so. 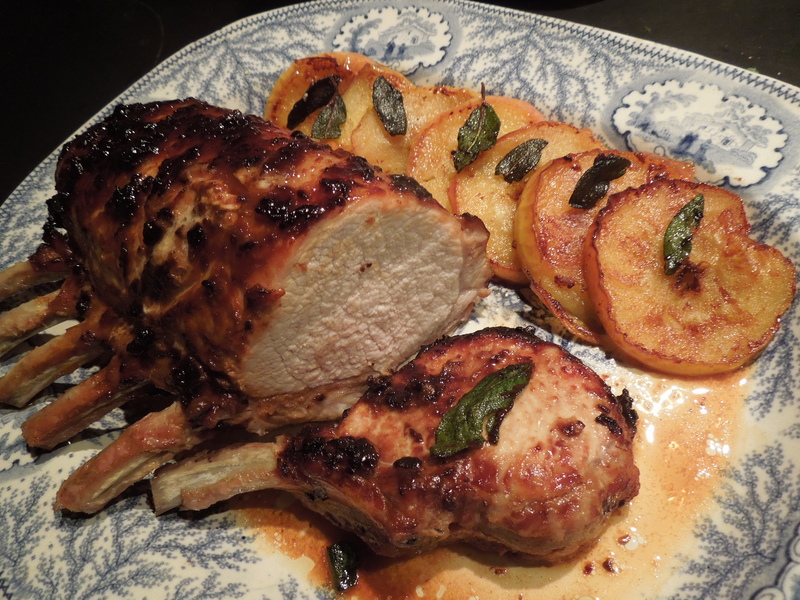 Serve the meat sliced into chops, garnished with the apple slices and fried sage. Drizzle with any pan juices and the juice that has run out of the resting meat, or if you prefer, deglaze the pan with a splash of cider or sherry. 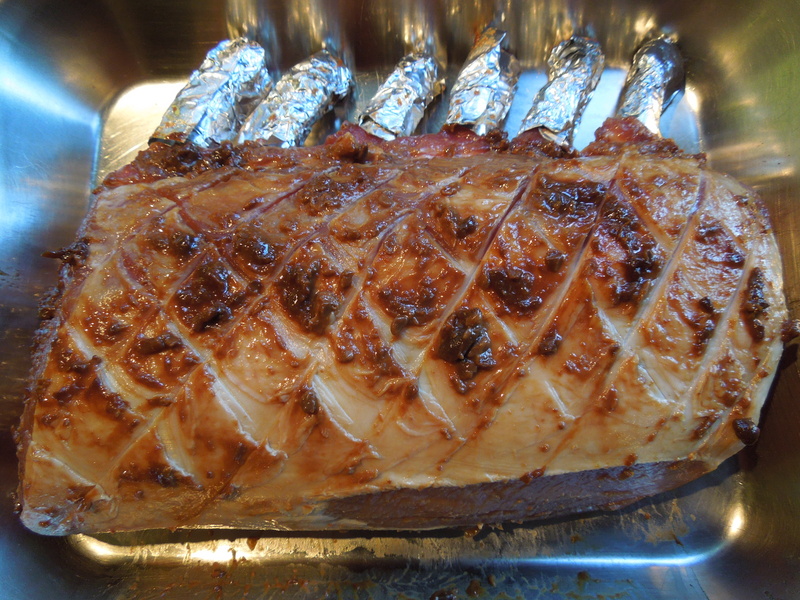 This entry was posted in Mains, Pork, ham and bacon and tagged pan-fried apples and sage, pork rib roast, rack of por with miso and honey, rack of pork by Linda Duffin. Bookmark the permalink. Too close to lunchtime to be looking at this Linda. I am dribbling on my shirt.